Mount Bromo, Songa Rafting and Ijen Crater Tour 3 days is one of East Java Island tour package that consist of the most popular volcano in Indonesia, the trip included the longest water rafting near Probolinggo city with amazing volcano crater at Banyuwangi named Ijen Crater Banyuwangi. If You are interested to take the Mount Bromo Sunrise, Rafting, Ijen Crater Tour package, You can begin your trip from Surabaya Airport or Malang in the morning. Hope You take the flight departure at evening around 06.00 - 07.00 PM. For visitors who begin the trip from Banyuwangi, You can choose Ijen Crater, Mt Bromo, Madakaripura Waterfall tour. For detail itinerary of Mt Bromo, Water Rafting, Ijen volcano trip, You can read more below. Our driver will pick you up in Surabaya, Malang, Banyuwangi using private AC (air conditioned) transportation then take You to Hotel around Bromo for 3,5 hours. Arrive in your Hotel, Stay 1 night. 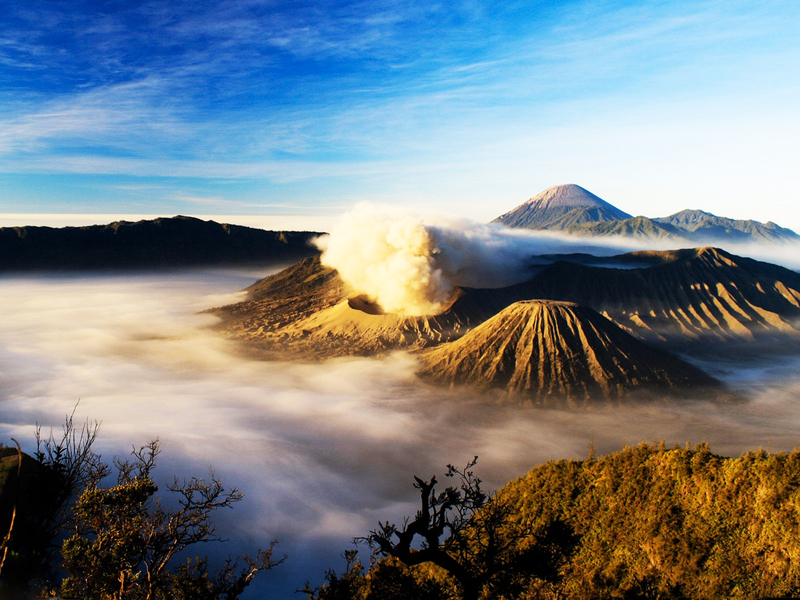 Mount Bromo tour package begin at 02.30 AM. Wake You up for preparing then take You to Panajakan (highest peak) using private Jeep 4 WD for 30 minutes. If You need to see Mount Bromo Milky Way, You can visit the highest peak at 10.00 PM. Reach the Parking lot at Pananjakan, trekking to the View Point for 10 minutes, continue waiting Mount Bromo Sunrise at 05.20 AM, Enjoy the beauty of Sunrise, Crater, Sea of Sand. From this peak, You will also able see the highest volcano in East Java that normally climbed by all tourist namedly Semeru volcano, The best time to enjoy Semeru volcano hiking package is on April - November. After finish enjoy the beauty of Mount Bromo volcano crater, comeback to the jeep then comeback to your hotel to have breakfast, take shower then preparing to check out. Get the Songa rest area, change your clothes then take an information from local guide about The white water Rafting trip requirements in Songa Rafting Base Camp for 15 minutes, afterward start Songa adventure using helmet, paddles, buoy clothes while bring waterproof pack for packing your phone, camera also other utilities. 03.00 AM, Finish Songa Rafting, have lunch, change your clothes and Continue the trip toward hotel around Ijen Crater area for 4 hours driving. Get your hotel around Ijen Crater, Stay 1 night. Get the Ijen Crater top, enjoy Ijen volcano view (green acid lake, yellowish sulfur crater and sulfur miners loading the sulfur from bottom of Ijen crater) until finish and comeback to paltuding (rest area) for 2 hours then comeback to Surabaya, Malang or Banyuwangi. Reach your location request, Finish Mount Bromo tour 3 days 2 night. Hope You make a booking within 1 - 2 months before Your vacation go on, In Order We can provide Your facility enoughly. Detail information about Mount Bromo tour price, Accommodation and other travel package facility, You can visit Our Contact.